FRSC begins operation “Show your license” in Lagos – Royal Times of Nigeria. 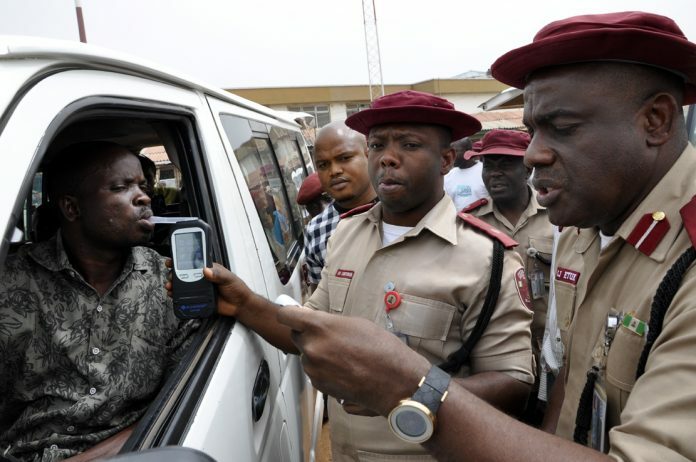 The Lagos State Sector Command, Federal Road Safety Corps (FRSC) says it has commenced operation “Show Your Licence’’ across the state to arrest drivers without a valid licence. The State Sector commander, Hyginus Omeje said this in an interview with the News Agency of Nigeria (NAN) in Lagos on Thursday. He said, “The state command, this week, inaugurated operation ‘Show your License’ campaign across the state to arrest motorists who had no valid driving license. “We are doing this as part of our ember month programmes to sensitise drivers on the need to possess valid licences before driving,’’. “The state command has recorded 57 road crashes in the third quarter of 2017, this development showed a decrease of 46.2 percent, compared to the same period in 2016”. “There are 55,802 unclaimed licences in the sector command due to the failure of many drivers to claim such documents”. Omeje stated that enforcement of speed limiters had brought a tremendous reduction in road accident across the state, adding all commercial fleet operators must install the speed limit device in their vehicles, noting that compliance level had reached 33.1 percent in the state. According to him, another 192 motorists were cautioned while seven motorists were charged to court for allegedly failing to install speed limiter. Omeje also said that there was a plan to equip all the patrol vehicles in the state with breathalyzers to detect motorists, especially the commercial ones driving under the influence of alcohol.